You just had the best day and night of your life – you got married! The wedding was perfect, not one flaw in sight. Everyone had an amazing time but they are feeling a little tired and run down the morning after. 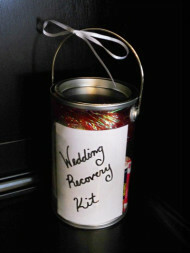 One amazing way to combat this, so that your guests will be presentable the next morning, is a Wedding Recovery Kit. These handy little kits can be used in lieu of a welcome basket. In them you include things that you know make you feel better after a night of drinking, dancing and merriment. 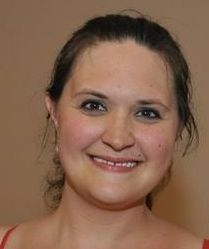 We are talking aspirin, water, mints, OJ, sunglasses, Band-Aids, Alka-Seltzer – whatever you think might help your guests after partying it up at your wedding. Customization is key. 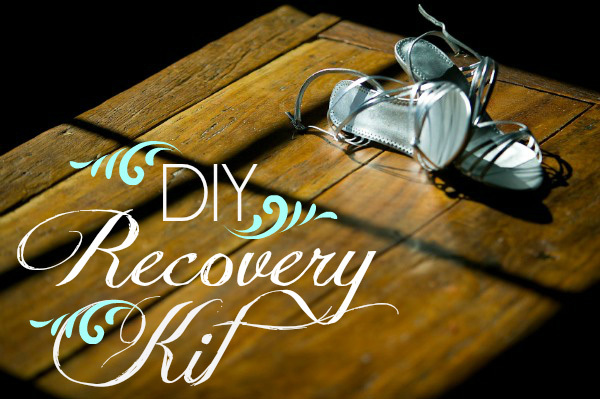 Whatever you choose to put in your wedding recovery kits, make sure they have a purpose. Try to keep a theme going. If you had a beach wedding, put OJ and sunglasses in the kit along with the essentials. Use specialty-designed labels that go with your wedding colors or a monogram with your new initials. And of course, a note from the new Mr. and Mrs. is always appreciated. Gather your items. Go out and purchase individual packets of Aspirin for headaches, Band-Aids for achy feet, Alka-Seltzer for sour tummies, bottles of water to hydrate, and mints for fresh breath. Have whatever specialty items you choose. 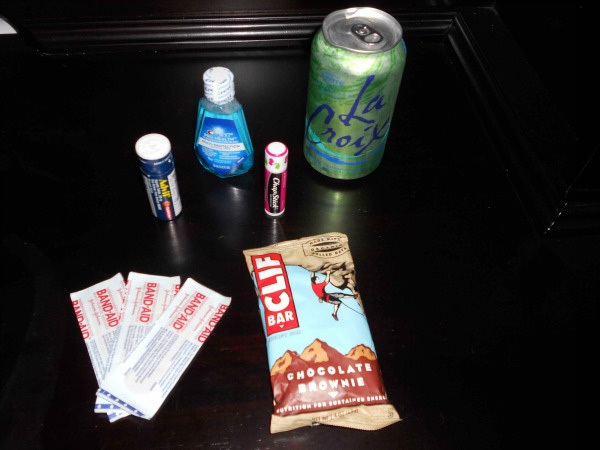 For this basket I chose Chap-stick, a Cliff Bar, Mouthwash, Band-Aids, a Seltzer Water, and of course Advil. We did a relatively small basket but you can add tons of snacks, sports drinks, gum, mini bottles of alcohol… whatever you think guests would like. Contain It. Choose how you want the kits presented. Do you want a tote bag, a basket or a cute clear paint can? You want to make sure that your container is in proportion to the items you will be including. Too big and it will look like the container is empty, too small and it will be messy and bursting. I like the paint can because you can add a label on the inside. Guests can also see what is in their kit without emptying the whole thing. Ready the Container and Swag. If you are using an open basket you need to build a base at the bottom so you can see what is in the basket. Do this by using tissue paper and/or packing peanuts. I applied a sign stating “Wedding Recovery Kit” in the front. I then tied a ribbon onto the top metal handle for an understated extra touch. You can add labels to the water bottle that read “Hydrate Away” and a special note from the bride and groom. Your imagination is the only limit. Arrange Away. For the paint can I was able to place the items in with no problem. You just want to make sure that all of your labels are facing out so guests know what they are looking at. Again, you can add tissue paper to the bottom if needed. This can help the items fit more snugly. Deliver to the Hotel and Guests. Decide when you would like the guests to have the kits. You can choose to have it in the room when they arrive. Have the note explain that this is for after the party. Just know guests may choose to use the items ahead of time. Another option is to have room service put it in the room while the party is going for a nice surprise post wedding gift. Though this might cost extra. You can also make a cute favor table with the Wedding Recovery Kits on it. If you want not only the perfect beginning and middle, but also the perfect end to your wedding, this is one great way to do that. However you chose to present your Wedding Recovery Kit it is a great touch for the people who made your wedding so special and something they will, hopefully, be able to remember forever. ahhh! what a great idea! Thanks for sharing! I like the idea but none of the pictures are loading for me (except the title one). Thought you may want a head’s up. Super cute idea!